The program views the development of the post-Soviet space through the prism of religion, ethnicity and other socio-cultural factors. Particular attention is paid to the role of Islam, problems of nationalism and the formation of political and economic elites. The program studies the situation in Central Asia and in the Caucasus, the position of ethnic minorities and inter-ethnic relations in various Russian regions, including Chechnya, Tatarstan, Bashkortostan and Dagestan, and the sustainable development of the oil and gas producing countries of the Caspian basin. Events in the Middle East and Russia’s participation in the Syrian conflict have left the majority of Russian Muslims indifferent and have not inspired them to take any particular action, let alone protest. Even the hundreds of militants who have returned from fighting for the banned Islamic State terrorist organization in the Middle East are behaving passively. The North Caucasus Islamists’ wish to join ISIS makes some sense. By joining, they would cast themselves not just as regional players but worldwide jihadists. The relations between ISIS and the Caucasus Emirate, however, have been fraught with difficulties. Russia’s official Muslim establishment blames the West for the rise of the self-proclaimed Islamic State and refuses to admit that radical Islam has a real social base, ignoring the radicalization of many ordinary Muslims in Russia and Central Asia. Despite his harsh rhetoric, Kadyrov now takes a pragmatic view of the Islamic State’s influence on the situation in Chechnya and is committing himself to “exorcise” would-be recruits or returnees from the Middle East rather than merely destroying them. In light of the crisis in Syria, and as part of its mandate to promote democracy and development in the region, the United Nations Economic and Social Commission for Western Asia (UN-ESCWA) has initiated a program named The National Agenda for the Future of Syria (NAFS). 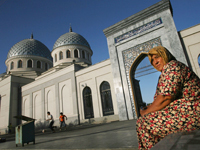 As Islam expands in the Ural Federal District, religious and political life there is evolving. Much of this expansion is due to the arrival of Muslim migrants from Central Asia and the Caucasus, and some migrants bring with them religious radicalism—a challenge that requires a more effective official response. Shia-Sunni sectarianism is one of the factors driving instability in the Middle East. An army mutiny is the only latest of many new threats to Tajikistan's veteran president. Russia is the only country he can rely on to support him and it will take advantage of his predicament. Where Will the New Taliban Leader Lead His People? The appointment of Mullah Akhtar Mohammad Mansour as leader of the Taliban in Afghanistan can be viewed in two ways: as a victory for Pakistan (which clearly supports Mansour) or as the strengthening of radical tendencies within the Taliban.